I wrote Panglor in my late twenties, immediately following my second novel Star Rigger’s Way, which is a coming-of-age space adventure. Star Rigger’s Way is full of youthful angst. 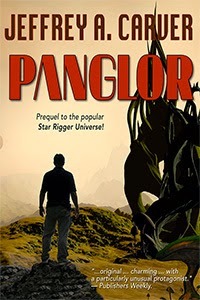 Panglor is full of angst squared, and the thought: What might happen if the frustration, angst, and anger of the young adult of Star Rigger’s Way never got resolved. What might happen if a good space pilot went a little off the deep end emotionally, turning just crazy enough to become a little scary, but still (just) within the bounds of professional competency? And what if he met up with a young woman, smart and a little off balance herself, seemingly born just to become a thorn in his side? And what if they both wound up on a planet occupying some kind of weird nexus in space-time, a place where reality itself seems broken, concealing a crucial discovery that will change the course of star travel? Panglor is listed as Book 1 in The Star Rigger Universe. Actually it’s a prequel to the Star Rigger Universe. It’s about the discovery that leads to star rigging. How we got from the discovery to the actual practice of star rigging is a story I haven’t written yet. Maybe I should!